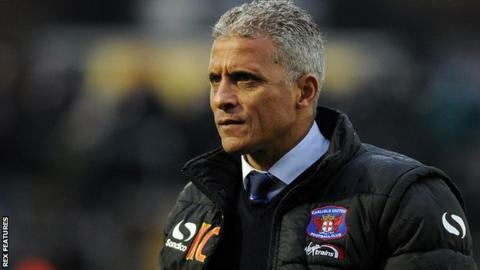 Manager Keith Curle wants to stay at Carlisle United despite not yet signing the contract that was "agreed" by the two parties in November. The Cumbrians confirmed an extension of his deal until June 2018, which currently expires next summer. Curle took over at Brunton Park in September 2014, helping Carlisle avoid relegation from League Two last season. "We know what our understanding was, we need to make sure we get it down on paper," Curle told BBC Radio Cumbria. "I'm not worried about it, I have a good understanding and working relationship with the stakeholders at the football club. "I'm no different from anybody else, I entered into negotiations because I wanted to stay." Despite the flooding of the city which has seen the club's home ground unusable and the staging of games at Preston, Blackburn and Blackpool, Curle's side are on a run of six games unbeaten, with four wins.